Road map to Sam’s Historic. TransCanada Highway ( Route 1 ) to Clarenville. Exit 26, road 230 ( Discovery Trail ). 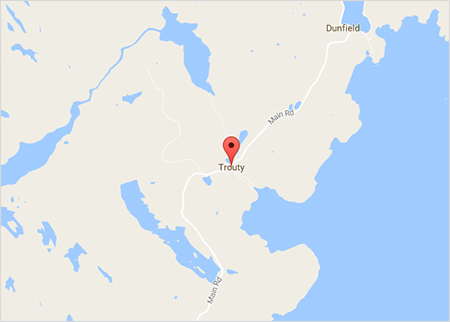 You drive approximately 65 kms then turn right on road 239 ( Lockston, Trinity, Dunfield ). First road left in direction of Trinity, you drive toward the town. You drive in front of the Royal Bank of Canada that sit at left, then make a right turn on Dandy Lane, then a right turn on Church Road, a final right turn on the second street at your right, Ash’s Lane. The path witch lead to the house is in between two houses, a Sam’s Historic Trinity sign shows it, 6 Ash’s Lane.